Publishing Industry: What is the Future of Newspapers, Magazines, and Books? 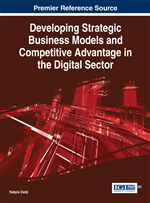 The general aim of this chapter is to show digitalization is one of the main threats that is shaping the publishing industry value chain and company business models. The analysis of the publishing industry structure is conducted from the perspective of international features. The value chain system of printed media publishing business is explored with more in-depth analysis of its elements. The primary objective of this research is to establish practical outcomes of Internet influence on the structure and business model of publishing companies. As rapid development in the IT sector and the Internet can be considered a crucial risk factor for contemporary publishing business, it creates new business models and changes the industry structure. Publishers progressively respond to changing consumer demands, especially around digital content. Effective pricing strategies for digital content will be the major challenge for magazine publishers. The current trends dominating the publishing industry are closely linked with several factors, among which: technological advances and the Internet development, changes in consumers’ preferences and usage patterns, increasing competition globally, social networks development, high fragmentation of the magazine market, and consumer and advertising revenues downturn due to economical and structural reasons. According to the North American Industry Classification System (NAICS), the standard used by Federal statistical agencies in classifying business establishments for the purpose of collecting, analyzing, and publishing statistical data related to the U.S. business economy, the publishing industry comprises mainly newspapers, periodicals, books, and directory and mailing list publishers. Newspapers include general newspapers and specialized newspapers, periodicals comprise general interest periodicals, professional and academic periodicals and books refer to textbooks, children’s books, general reference books, professional, technical, and scholarly books. These works are characterized by the intellectual creativity required in their development and are usually protected by copyright. Publishers distribute, or arrange for the distribution of copies of these works that may be published in one or more formats including traditional print form, electronic and on-line. It is important to distinguish publishing from printing. Printing concerns the physical manufacturing process. While an independent economic activity, printing is nevertheless seen as an integral part of the publishing industry supply value chain. This chapter focuses mostly on magazine publishing.